A few months ago I found a really cute pattern to make tiny little owls, designed by Josephine Wu from A Morning Cup of Joe. I crocheted a bunch of them last December to decorate the Christmas tree, then recently I made a few again as keychains. It is the perfect pattern for beginners, the owls are very easy to make. Watch out though, once you crochet one it is very difficult to stop… Hello, assembly line! Since it doesn’t require a lot of yarn you can use scraps from leftovers. The pattern ask for safety eyes, but I just glued some goggly eyes instead because I had just bought a pack. I also used felt for the nose instead of embroidering it, and added little feet. I love this pattern, if you run out of gift ideas, or if you don’t have a lot of time to take on big projects, this little owl will make anybody smile! Josephine’s pattern is a free PDF file that you can download on Ravelry, or on Crafsty. I have been very busy making ornaments for the holidays season, Santas, snowmen, angels, penguins, elves etc… My house is filled with Christmas decorations and we are not even half way through November. 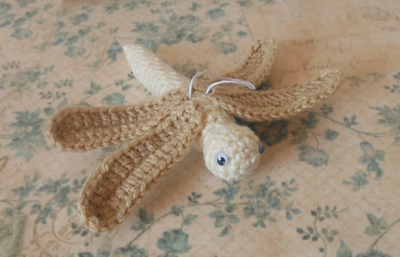 One of the ornaments I made is a little dragonfly, a really cute little amigurumi that you can hang on your tree during the holidays season, or use as any kind of decoration. I made mine beige and brown, but you can use any color you like. The size of the dragonfly is about 6 inch long, with a 2.75mm hook. Fasten off, and weave in the loose end in the last stitches of the tail. With brown yarn, 17 in ch. Rnd 1: 2 sc, 2 hdc, 11 dc, 4 dc in last st, turn and continue on the other side of the chain, 11 dc, 2 hdc, 2 sc. Fasten off, and weave in the loose ends. 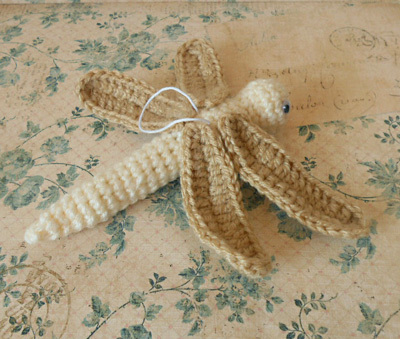 – Cut a piece of embroidery thread, insert in the stitches on top of the dragonfly, and make a secure double knot. Move your thread until the knot is hidden inside the body. I hope you enjoy this pattern, and if you have any questions, don’t hesitate to ask me.